Wondering if Work in Progress or coworking in general is right for you? Here’s a quick rundown of how we work in Las Vegas. We work with free coffee and filtered water. Drinks plus snacks! All our members have access to free coffee, filtered water, ice, and a snack cabinet. We make the coffee from 8–5, so if you work during regular business hours you’ll have hot coffee ready for you. We work when we want, and how we want. Work in Progress is open 24/7 for Key, Resident, and Team Room members. We offer a variety of membership options for professionals who need something a little different. We have a large coworking area where members come in between 9 and 5 every day, pick a spot, and start working. Members can also upgrade their membership to get a designated desk or 24-hour access to the building. We also have private team rooms for individuals or groups who want a private office within our coworking space. 24/7 key access lets members hit the office whenever their creative juices are flowing. We work in Las Vegas when and how we want. We work with plenty of parking. Parking in downtown Las Vegas can be a huge pain. Luckily we have a parking lot behind our office, and a parking garage connected to our office where members can park for a small monthly fee. It’s tough to find a place with super affordable covered parking options downtown. We work in a central Las Vegas location. We’re located downtown. As in, right in the middle of everything. 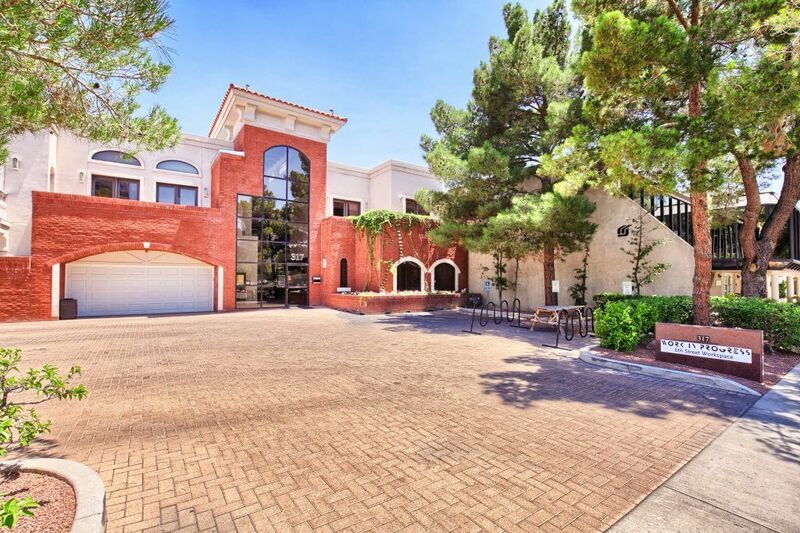 A few blocks from Freemont Street, a couple miles from the Strip, only a 20-minute drive from Summerlin and Henderson, and central to pretty much the entire Las Vegas area. There are a ton of good restaurants and bars within walking distance as well. We work in downtown Las Vegas, close to killer restaurants and hangouts. We work with access to mentors. Our mentors are successful professionals who have worked in a wide variety of professions. We have business attorneys, startup pros, business owners, tech guys, investors, and we’re constantly adding new mentors. Mentor sessions are usually available a few times a month, and the one-on-one meetings last about 30 minutes. If you aren’t a WIP member, you can buy a day pass on the day the mentorship session is scheduled to get on the mentor’s schedule. We not only have mentors, but we offer several monthly Meetups and events. One of our resident companies NeONBRAND hosts weekly Meetups at Work in Progress for SEO, social media, business management, and more. We frequently host events like pitch practices and pitch nights with investors in our Startup Garage. There’s always something going on at Work in Progress. It’s a hub of tech and business in downtown Las Vegas. We work in Las Vegas at Work in Progress. Give us a call if you’re looking for office or event space in downtown Las Vegas, or schedule a tour online!